Non-contact, laser measurement does not deform or mark measured objects. Available in 27 or 57mm maximum measurement models. Provides statistical analysis of measurements. Available fitted with optional rotary chuck or V-groove sample holders. For off-line, stand-alone use in incoming inspection, quality control and laboratory applications. Derived from the highly successful InteliSENS® DG Series of scanning-laser diameter gauges, the InteliSENS® BG Series bench gauges are intended for off-line, stand-alone use in incoming inspection, quality control and laboratory applications. 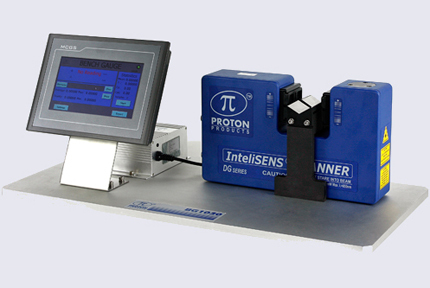 A Proton Products InteliSENS® DG Series scanning-laser diameter gauge is integrated together with a miniature touch screen PC and a mains power supply unit on an aluminium baseboard. Depending on the application, optional ground steel V-grooves or a rotary chuck may also be integrated for precise sample holding. InteliSENS® BG Series bench gauges are a fast, easy-to-use and non-contact alternative to vernier callipers and micrometer screw gauges. The touch screen PC provides measurement display with automatic maximum/minimum and ovality calculation, statistical analysis and data logging. Logged data may be extracted from the touch screen PC using a USB flash memory stick. Proton Products InteliSENS® DG Series diameter gauges rapidly scan a laser beam across the object under measurement. The laser beam is focused by a receiving lens onto a photodiode and the electrical signal digitally processed by a Proton-designed FPGA processor. The time duration for which the object obscures the laser beam is directly proportional to the object diameter.